1. Husband singing songs made up just for me. I love these muffins! 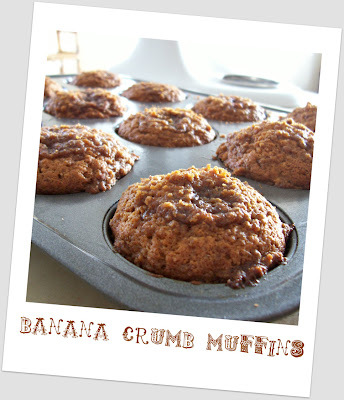 They were the tastiest banana muffins I’ve had in a long time. The buttery brown sugar and cinnamon crumb topping is what separates these muffins from the crowd. Yum. Yum. Now, don’t get too excited just yet. Be sure you have time first. You will not have the luxury of 1 bowl cleaning that follows most muffin recipes. If you’re like me, you’ll realize that somehow dishes seemed to really pile up in the sink after mixing up these lovely bites. You have been warned. Don’t let that stop the banana goodness! Preheat oven to 375°. Lightly grease 10 *Mine made 11 muffin cups, or line with muffin papers. In a large bowl, mix together 1 ½ cups flour, baking soda, baking powder and salt. In another bowl, beat together bananas, sugar, egg, cinnamon and melted butter. Stir the banana mixture into the flour mixture just until moistened. Spoon batter into prepared muffin cups. Bake in preheated oven for 18 to 20 minutes, until a toothpick inserted into center of a muffin comes out clean. Cool 15 minutes before removing from pan. Those look yummy! A friend just gave me some over ripe bananas too! They look gorgeous and super tastey. I hear ya, I love muffins with “crunchy” muffin tops too. They are the best. I think these would make my list of top 10 things I love for a couple of reasons, first bananas and second, crumb topping!